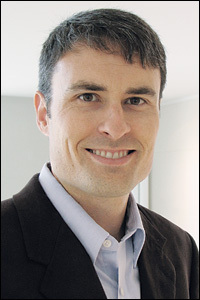 Assistant Professor Ian White (joint, BioE and ISR; member, Maryland Nanocenter). The Fischell Department of Bioengineering (BioE), the Institute for Systems Research (ISR), and the Maryland NanoCenter extend their congratulations to Assistant Professor Ian White, who received the E. Robert Kent Outstanding Teaching Award for Junior Faculty at the Clark School’s Fall Commencement ceremony on December 22. Since joining the Department in 2008, says BioE professor and chair William E. Bentley, White has “consistently demonstrated a strong commitment to excellence in education” both in and outside of the classroom, in outreach, and as a mentor to senior Capstone Design teams. “Ian has applied a unique combination of inquiry-based education and a peer-based learning environment to his courses, often described by students as the best that they have taken during their time on campus,” he explains. “We are extremely fortunate to have him among our faculty,” Bentley adds. “Students appreciate his desire to help them succeed, his approachable nature, and his ability to explain even the most complex topics in straightforward manner. Our students are getting an outstanding education and by his presence are also feeling like they count.” It was these qualities, says Bentley, which earned White the Fischell Department of Bioengineering Teaching Excellence Award in 2012. Over the last four years, White has worked closely with BioE research associate professor Leigh Abts to introduce BIOE 100: Introductory Mathematics for Engineering Applications into area high schools. The goal of the course is to improve the success rate of underrepresented groups in engineering by introducing them to college-level math and basic engineering principles. Together with Abts, White has been instrumental in the development of the course, running a summer workshop that prepares high school faculty to teach it, and its implementation at the Friendship Charter Schools of Washington, D.C., and Oxon Hill High School in Md. White’s research group develops integrated microsystems for lab-on-a-chip diagnostics, chemical and biomolecular detection using optofluidic and inkjet-printed surface-enhanced Raman spectroscopy, portable sensing systems, and the study of cancer metastasis. To learn more, visit his web site at bioe.umd.edu/~ianwhite. BioE professor and Chair William E. Bentley.